The following article is a re-post of Catholic schools foster respectful communities through “No Place for Hate” program by Kelly Sankowski. 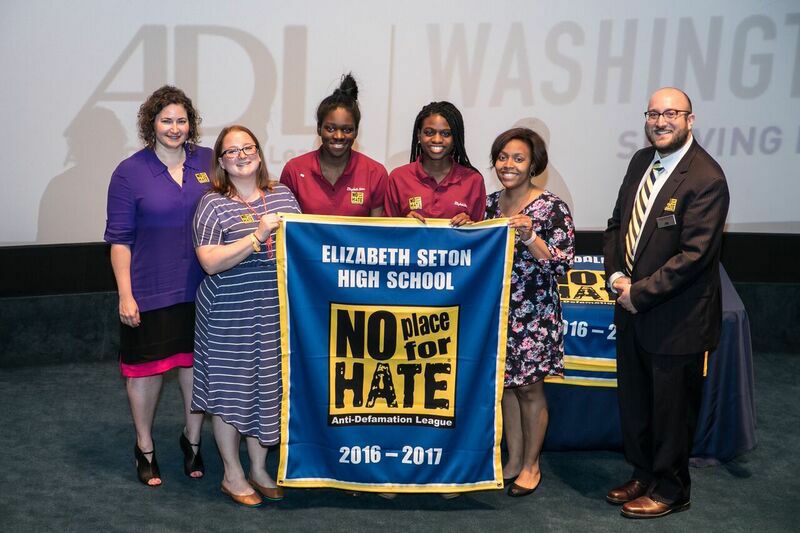 PHOTO COURTESY OF ELIZABETH SETON HIGH SCHOOL Students and teachers of Elizabeth Seton High School in Bladensburg and representatives of the Anti-Defamation League hold the No Place For Hate banner that the school earned for the 2016-17 school year. For three years in a row, Stone Ridge School of the Sacred Heart in Bethesda and Elizabeth Seton High School in Bladensburg have participated in the Anti-Defamation League’s No Place for Hate program, promoting diversity, inclusion and respect in their communities. Stone Ridge was the first school in the Washington region to formally adopt the No Place for Hate Program before it launched in the 2015-16 school year, and both Stone Ridge and Seton have received the “No Place for Hate” banner for the three years since then. ADL is proud to partner with two outstanding schools from the Archdiocese of Washington, Stone Ridge School of the Sacred Heart and Elizabeth Seton High School, to make their communities ‘No Place for Hate’ each school year,” said Seth Gordon-Lipkin, ADL’s education director for the Washington region. “…By becoming No Place for Hate schools, Stone Ridge and Seton have set a standard for other schools in our area that acceptance and respect must be priorities for our educational institutions in times of division. To be designated as a No Place for Hate School and receive the banner, the schools must complete a needs assessment, form a No Place for Hate committee, sign a Resolution of Respect, and design and implement at least three school-wide anti-bias or bullying prevention programs. The Resolution of Respect includes several points that students promise to adhere to, which vary depending on the age level. For older students, they promise to seek understanding of people who are different than them, speak out against prejudice and discrimination, support those who are targets of hate, promote respect for people, believe that one person can make a difference, and recognize that respecting individual dignity and promoting intergroup harmony are the responsibility of all students. Last year, Stone Ridge hosted a Peace Day in the fall and a Multicultural and Diversity Festival in the spring. In the Upper School, they regularly host brown bag lunches where the students get together at lunchtime to discuss difficult issues. After there were several hate crimes in the area following the 2016 election, the school decided to engage in a positive way by hosting an “artivism” day where students created projects in different mediums expressing their thoughts about various social justice issues. “I love how the festival and Peace Day illustrate the beauty and magnificence of all cultures, and how awesome it is that we encounter so many different types of people and perspectives in America, which is a melting pot of diversity,” said Stone Ridge senior Nia Williams. At Seton, they host movie viewings for students to learn about and then discuss different topics, such as civil rights, and also host “Chat and Chew” gatherings for students to share snacks and discuss issues that are important to them. They also recently hosted a door-decorating contest on the topic of women’s empowerment, where each study group chose a woman they felt had a big impact on the world and decorated a door to teach about their life. DON’T limit discussions about diversity and inclusion to special events. Elizabeth Seton’s “Chat and Chew” gatherings and Stone Ridge’s brown bag lunches are both examples of how they incorporate these discussions into more regular, casual gatherings. “It gives them a safe space to talk about current events, because when they talk about them on their own, often they don’t feel the same responsibility to be respectful, to be civil as they do when they are doing it in a more formal context,” said Lauren Brownlee, the director of social action at Stone Ridge. Before entering into these types of discussions, Brownlee said it is important to teach students tips for dialoging with people who have different opinions, such as: affirm you heard what was said, be transparent, cite shared values, respond from a place of compassion, ask questions, and focus on facts. 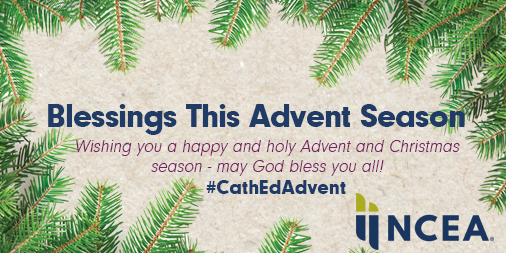 Angela Rohan, the director of student activities at Seton, said she felt this program fits well with the school’s Catholic identity, which emphasizes the dignity of all people. I think this program hits on that over and over,” she said. “It helps us understand more, reach a greater level of respect for all people. Austin said the principles of the No Place for Hate Program fit well with several of the goals of the schools in the Sacred Heart network, especially goal three and goal four: a social awareness that impels to action and building of community as a Christian value. “All people are children of God. They are loved regardless of who they are,” said Gadina. DO allow students to be the leaders. It is important to empower students by listening to what they need, said Rohan. It is not my school, it is their school. I’m here to serve them, she said. In addition, she feels it is important to let them lead, because they are so close to stepping into the world on their own as adults, and this allows them to start learning how to speak up for themselves and what they believe in. DON’T be afraid to speak up and get involved – or even start a No Place for Hate program at your school. Gadina said it has always been important to her, “To understand different perspectives and learn from people who are different than myself,” so as soon as she got to Stone Ridge she started getting involved in different diversity related activities there. At first, she said she was nervous and hesitant to speak up in meetings, but she saw how passionate the older students were and “it really helped me to break out of my shell,” said Gadina. Stone Ridge students hold the No Place for Hate banners that the school earned during the 2017-18 school year. In the back, they are joined, from left to right, by Catherine Ronan Karrels, the head of school; Malcolm McCluskey, head of the upper school; Karl Austin, chair of the middle school science department; Giovanna Basney, a middle school math teacher; Cindy Sabik, former head of the upper school; and Seth Gordon-Lipkin, ADL’s education director for the Washington region.